Since November 2012 we are organising for a boost in the development of SubScript. This site aims to get the word out about the qualities and potential of SubScript and get more people involved. Currently we are working on the SubScript extension to the Scala language: the VM has been implemented for over 50%. As of 20 February 2013 a rudimentary version of the compiler is ready, which is a branch of the regular Scala compiler; the available examples make clear what parts of the language are supported. There are unit tests for various script operators; other features such as the flavors of script parameters still lack unit tests. A rudimentary but useful visual debugger is available; it will be improved over time. 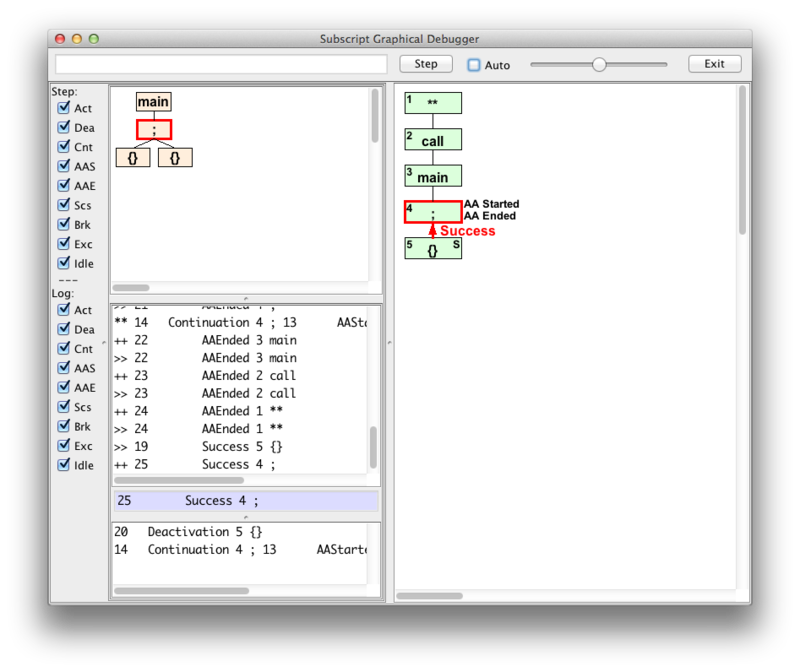 The GUI controller of this debugger has been implemented in SubScript. Documentation is available, but this needs more work. There are no tutorials yet. This might help in targeting other backends.